The new World Championship match between Magnus Carlsen and Viswanathan Anand starts tomorrow in Sochi (watch it live here!). On the eve of that hugely anticipated encounter Vlad Tkachiev takes a comprehensive look at what we can expect. His starting point is the hard-to-dispute fact that Carlsen is the overwhelming favourite, but he ends wondering if Anand still has a chance if he’s willing to embrace chaos. This article is translated with permission from the Russian original at Vlad Tkachiev’s new blog ChEsSay. Nothing of interest is going to happen in Sochi in November. The outgoing generation will get beaten up by the new. A humiliating scoreline. A general feeling of hopelessness. In short, a miserable spectacle. Heck, it’s simple dialectics! It’s time to think about what’s going to happen afterwards. Everything – the bookmakers’ odds, the media backdrop, public opinion – is set up to prepare us for precisely that state of affairs. The very fact that no-one could be found in India or Norway to hold the match speaks for itself. In short – a “rematch”, as it’s called in English. A repetition of what’s gone before. Having said all that, I’m 40 years old. And during the match I’ll turn 41. And as a Soviet-Kazakh-French chess player living in Moscow I can still recall the concept of a “match-revanche”. That exists in French and Russian, but not in English. An ageing champion who had rested on his laurels and been knocked off the pedestal of history by a younger challenger refocuses all of his analytical skill on the matter in hand, reprograms himself for a new challenge and… a brilliant comeback: “I showed everyone how you need to play against Tal” – Mikhail Moiseyevich Botvinnik, the Patriarch of Soviet Chess. By the way, the Russian word “revanche” comes from the French term “to return”, and in general it means retribution, revenge. The automatic right of a champion to have one more match if he lost the first was abolished in 1962. You could say it was reinstated just once more for A. E. Karpov in 1986, which is no surprise – after all, he’s a pupil of Botvinnik’s. Kasparov, of course, was outraged to the pit of his stomach, but after losing to Kramnik in 2000 he also demanded the privilege be reinstated. And when he didn’t get his way he soon quit chess. You may well ask – what’s the purpose of this long historical digression? Simply that by earning the right to one more summit meeting with Carlsen only a year after his defeat in Chennai Anand has essentially ended up in the happy position of Botvinnik and Karpov. A chance to come back, to get it all back and triumph. Veni, vidi, vici all over again. Will he manage? A rematch or revenge? 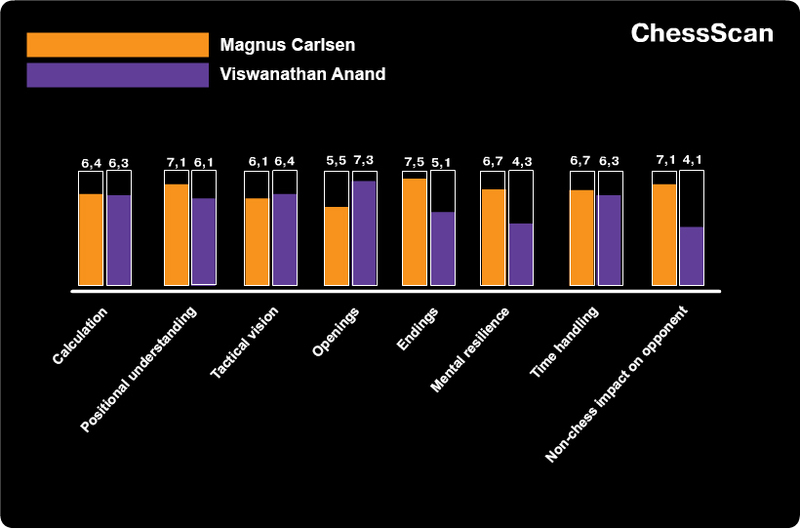 Ten grandmasters were asked to rate Magnus Carlsen and Viswanathan Anand on a 1-8 scale for a series of factors. Those participating were: Maxime Vachier-Lagrave, Sergei Rublevsky, Romain Edouard, Murtas Kazhgaleev, Matthieu Cornette, Fabien Libiszewski, Vladimir Dobrov, Alexei Barsov, a 2700+ grandmaster and Vlad Tkachiev. So then, according to the ten grandmasters surveyed Anand’s chances lie exclusively in the opening while Carlsen, in turn, dominates when it comes to positional understanding, the endgame, mental resilience and his non-chess impact on his opponent. Especially on this particular opponent, as a few of those questioned emphasised. Of the six wins, four were scored by the Indian player in a complex dynamic struggle and two in equal endings. The last of those was the result of a tactical oversight by the Norwegian. Carlsen came out on top three times in long endings, and also won three games in complex multi-piece middlegames. Leaving aside the categories where the players are roughly equal let’s switch to analysing the aspects where one of the players stands out against the other. I’d assess the players’ status with regard to this element of chess as good but not perfect. Both end up positionally outplayed from time to time, most often in an unfamiliar situation. Incidentally, it’s noticeable that Carlsen hasn’t handled complex doubled-edged positions well recently – he’s been unable to find clear and simple recipes to meet them. That’s a weakness where he has a lot in common with Bobby Fischer. Anand-Kramnik, Corus 2010 after 17.Qc1!? Here it’s worth recalling one more of Viswanathan’s unique qualities – his instant adaptation of something he’s just seen. The best example of that was Wijk aan Zee, January 2011, the pre-crisis period, when Anand twice (!) used an idea that was shown in the previous round the next day. As Gelfand described in an interview for whychess.com, every second game in the database on an interesting topic belongs to Anand. I think that’s how it was. But I disagree with the disparaging evaluation of the Norwegian’s opening preparation – it’s simply different. And it has the goal of achieving a comfortable position rather than firing down a winning ace. That, and much more, makes it possible to compare him to the tennis player Rafael Nadal. 2008 - January 2010: The very powerful influence of Garry Kasparov, the Grünfeld Defence, the Tartakower-Makogonov-Bondarevsky, the Dragon, the Sveshnikov – with Black. With White – the bold move 1.d4, with well-prepared digressions into 1.e4 and 1.c4. The peak of this period was Nanjing, September 2009, jumping from 2772 to 2801. 27 January 2010 – 3 September 2011: Having fallen out with Kasparov after losing with White to Kramnik, Magnus throws himself into experiments. It was then that the King's Indian Defence appeared (true, it didn’t work out so well), the Four Knights, the Chigorin Defence and other foolishness. He once even played the King’s Gambit – I’m scared to imagine the facial expression of Garry the Terrible at that moment. But his talent kept growing, and there was no regression, although no progress either. The “Chess Mozart” wisely took a break from the World Championship cycle and after a huge collapse at the Tal Memorial (even if only in rapid chess) - =2, -3, +0, he saw reason. It was time. September 2011 – January 2013: Carlsen accumulates a whole complex of opening systems, looking for long games and repeated use: the Ruy Lopez with d3, the Sicilian with Bb5, g3 and such like, the Slav with 3.Nf3 and 4.e3. With Black the Berlin and the Nimzo-Indian, retaining the chance at any moment to amaze with some unexpected bluff or file from Kasparov’s archive. The peak of this phase was Wijk aan Zee 2013, when he jumped all the way up to 2872. He had his sights set on the World Championship match and qualification for it. March 2013: back to business, as in the pre-historical times. Nielsen joins the team (while still Anand’s long-time trainer, which is stunning!). Magnus is unpredictable in his choice of openings but predictably well-prepared. The goal is achieved, so a new team is required. May 2013 - August 2014: The team, featuring Hammer, Fressinet and Nielsen returning after the match in Chennai, excels in finding tough, dry and endgame-focussed systems. He starts to play 1.Nf3, 2.g3, retains his love for the slow Ruy Lopez and the Anti-Sicilians. Nielsen traditionally refreshes his 1.d4 repertoire for both White and Black. At the same time Carlsen is capable at any moment of saying to hell with it all and playing, for example, the Scandinavian with 3….Qd8. We won’t, of course, see any such "gangster moves" in Sochi. August 2014 - November 2014: Peter Heine Nielsen is officially declared the head of the Norwegian’s coaching team. What does that promise? I don’t know. More likely than not nothing good for the Tiger from Madras. Carlsen-Grischuk, Norway Chess 2014 after 19.Bf3: "No, Carlsen was not the first one to enter this endgame, but he understood the problems Black faces in this apparently cloudless position." Carlsen-Gelfand, London Candidates 2013 after 14.a3! "Now Black has the difficult choice of whether to allow White to push b2-b4 or not. In the game Gelfand's problem was the absence of a good square for the queen." Carlsen-Nakamura, Shamkir 2014 after 6.Be2. After 6...h6 Nakamura responded 7.Bd3! - "With the finesse on the 6th move White limits Black's choice since there's no longer the option of Bg6." Fressinet-Radjabov, Bilbao 2014 after 20.h4!? - "A very interesting and completely new approach to this well-known theoretical position. 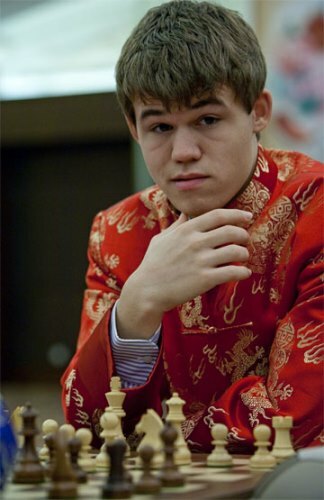 Don't be surprised by my choice of example: many of Carlsen's hidden ideas can be found in his seconds' games." Fressinet-Jones, 1-0, Isle of Man 2014 after 5.d4. Play continued 5...cxd4 6.Qxd4!? "And now the Hedgehog structure is practically inevitable. Preparation very typical of Carlsen's team." Anand, meanwhile, has never been counted among the endgame virtuosos even by his most ardent of fans. I’ll nevertheless dilute a selection of blunders by the great Indian player with one example of wonderful technique against Carlsen, even if it dates from a long time ago. Anand-McShane, 1/2-1/2, London Chess Classic 2012, after 90.Ra1?? - McShane replied 90...Re5? instead of the winning 90...Kg4! There’s no better indicator for measuring this strange substance than the way a chess player plays after a defeat. So then, after losing in the early stages of a tournament Carlsen has never (!!!) in the last 4 years finished on a minus overall: Wijk aan Zee 2011, Round 3, Carlsen-Giri 0-1, ultimately +3; San Paulo/Bilbao 2011, Round 3, Vallejo – Carlsen 1-0, ultimately +2; Bilbao 2012, Round 1 Caruana 1-0 Carlsen, ultimately +3; St. Louis 2014, Round 3 (note the repetition!) Carlsen 0-1 Caruana, ultimately +1. Anand, meanwhile, only once in that same period rose to the top in a similar situation: Paris-St. Petersburg 2013, after losing the first game to Adams with White Vishy had scored +1 after ten rounds. True, it would be a stretch to call that a supertournament. Anand-Andreikin, 2014 Candidates. 39.Kb3 Nc5+ 40.Kc2 Na4+ 41.Kb3 1/2-1/2 Anand was winning after 39.Rc4! bxc4 40.Bxa3. It’s doubtful there’s much point in spending any more time proving the obvious: in terms of mental stability there’s a gulf between the players. Which was adequately reflected in the figures. In general, from my observations, the tangible deterioration in Viswanathan’s play took place in the second half of 2011, precisely at the moment he finally conceded first place on the rating list to Magnus. The reason? Some will say he relaxed after winning his match against Topalov, but for me it’s obviously something else – in April of that year the Anands had a son, Akhil. It seems the joy of fatherhood and the accompanying incessant crying of the infant didn’t go well with getting in the mood for an uncompromising fight. If that’s the case then there’s bad news for the Norwegian: the child has grown. And the father, along with him. Have you ever played against Carlsen? Some may have, but for the majority, I suspect, the answer is a no. So then, that one-man theatre already starts with the handshake – in Magnus’ case it’s sharp, almost a jolt. That’s matched by his behaviour during a game, which is unusually free and relaxed. Combine that with the aura of a winner and it all weighs down on his opponent’s psyche, which is no surprise – after all, that’s why it’s done, at the end of the day. The magnetism of a strong personality brings a bountiful harvest of extra points. Incidentally, Vishy has always been vulnerable to such external pressure. It’s enough to recall the story of his clash with Kasparov, and the way in which he only really shone after Garry quit chess in 2005. Whether anything has changed in that regard is hard to say: on the one hand, the Indian is no longer weighed down by the burden of the Championship crown, but on the other hand… Take a look at this amusing video from Dubai, in which the hands of Anand while WINNING a game are more eloquent than Nigel Short. It seems the problem hasn’t gone away. Has Viswanathan himself tried to influence his opponents? Consciously – never, but indirectly – you bet, spending 15 minutes to half an hour on a game in his best years. And although he’s no spring chicken any more, and young opponents calculate variations like true computers, we might recall that in Khanty-Mansiysk Anand was ALWAYS ahead of his opponents on time. If he did that with the following match in mind then that’s one more potential hidden trump for the Indian. Something to at least even out the otherwise negative backdrop. So then, the answer to the question in the title is obvious and what awaits us is a repetition of what’s gone before? In order to carry out revenge you need Hamlet’s sword or the hammer of the hero of the film “Oldboy”, but there’s nothing in Anand’s hands at the moment and no prospect of anything appearing. It’s more a silent question on the lips, “to be or not to be?”, which in chess always means one thing – you get beaten. The problem here is methodological: within the linear three-act structure opening-middlegame-endgame there really isn’t any chance, because there, at the end of the tunnel, in the sixth hour of play, a silent sphinx inevitably awaits posing a question to which there's no answer. In 1992 the American diplomat and Master of Political Science Steven R. Mann published a seminal work entitled “Chaos Theory and Strategic Thought”. Under the influence of the mathematics of chaos theory, that enthralled minds in the late 80s, the author proposes a few theses which also inspired me to write this article. Where is all this leading? The only real chance I see for Anand in the upcoming clash with “a representative of alien civilisation” (©Kramnik) is to reject the traditional forms of preparation, conducting a game and distributing the psychological roles. To return to the original condition of everything in the world – chaos. In common parlance that’s known as “muddying the waters” – an expression that exists in all the languages I know. When applied to chess that means striving towards complications, avoiding typical linear opening systems and rejecting the transition to endless classical endgames. Applying pressure on the clock can also only destabilise the course of events yet further. A perfect storm - by choice. That was precisely how Lasker neutralised Steinitz, how Geller terrorised Bobby Fischer and how Kasparov struck down Karpov. Orthodox means should be cast aside. But what do I know about Hinduism?